A pictorial peek into PG&E stock. As market mayhem continues, income investors are on the hunt for safe and reliable stocks. Historically, utilities such as PG&E Corporation (NYSE:PCG) have been some of the most stalwart stocks out there. But they can also be complicated to understand, and their future is arguably more complicated than it's ever been before. To better understand PG&E stock's situation, let's take a closer look at how it compares with Exelon Corporation (NYSE:EXC) and Duke Energy Corporation (NYSE:DUK) in three charts. First and foremost, examining stock prices alone puts PG&E stock at a disadvantage. It and other utilities dole out sizable dividends (more on this later), so examining each stock's total return price is the only way to accurately determine what value investors are receiving. 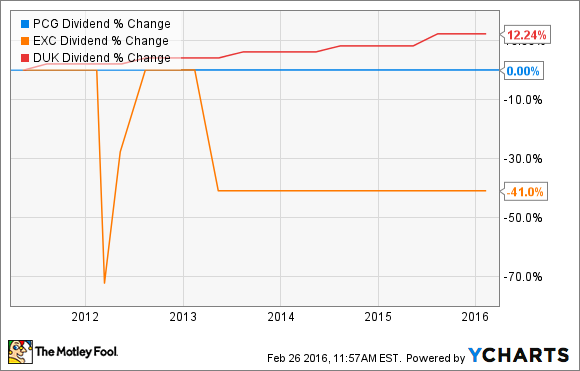 Over the past five years, PG&E stock's total return price has managed to increase 50%. That's well above Exelon's flatline, but falls behind both Duke Energy and the S&P 500 Total Return (INDEX:^SPTXR). Regardless of which stock has currently come out ahead, this chart should serve as a warning to investors: utilities are not the dependable stocks they used to be, and shareholders could find themselves burned if they expect steady returns. 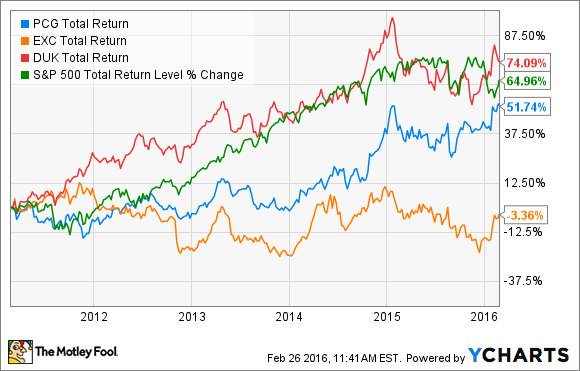 So with erratic stock prices, are PG&E, Duke Energy, and Exelon still delivering dividends? It depends. For Exelon, its up-and-down (and ultimately down) distributions have left income investors will smaller absolute dividends than they enjoyed five years ago. PG&E stock has kept its own distribution steady, while Duke Energy has continued on its "dividend staircase" course, inching distributions every year. But for those looking to invest down, dividend growth doesn't tell you where current yields stand. Here, it's PG&E stock that brings up the rear with a 3.2% yield, surpassed by both Exelon (3.9%) and Duke Energy (4.4%). Let's take a break from stock analysis to take a look at the actual company that is PG&E. In a word, PG&E is clean. One of the major worries for many utilities is how new regulation will affect their energy portfolios. In particular, the federal Clean Power Plan and state-level renewable energy regulations have added significantly more risk to some company's upside. For a company like Exelon Corporation that relies on nuclear power in Illinois for one-third of its portfolio, any negative nuclear regulation or outsized support for other energies would be disastrous. Coal has been Duke Energy's biggest worry, and the utility has already retired nearly 5,000 MW worth and has potential plans to shutter an additional 4,000 MW. As the preceding chart indicates, PG&E Corporation has already made major advances toward clean energy. More than half of its portfolio is greenhouse gas free, and one-quarter of its energy portfolio already meets renewable-energy standards. While other utilities will have to make major retirements and additions to appease state and federal regulators, PG&E is simply ahead of the green game. Charts such as the ones here are an excellent way to begin forming an investment thesis. For investors looking for a relatively safe and forward-thinking utility, these charts indicate PG&E is a solid match. The utility might not have as much upside as others, but it's relatively low-risk offering and steady dividend should mean a lot to income investors.